The best in artificial intelligence usually comes from the tricks your eyes can play on you. Case in point, with Spot the Diff' 2 you will most likely be straining your eyes looking for that one minute difference between the two pictures when someone else takes a quick peek and points it out. This can be genuinely frustrating, but also fun. And as of late it seems that more and more developers have been getting an urge to create these games. This is one of the best. The game has a unique style and uses very slick menus and transition screens. More awards can be seen at the SPOT THE DIFF' 2 page. Ready for a fun peg game? Jump Over is what you've been waiting for! You have a board filled with pegs. Jump the pegs over each other to clear the board and score points. Don't be too slow when deciding which peg to jump, a timer is going! I especially liked the Try Out mode, where you can view and practice different levels before actually playing them. Along with the game board, you'll see move number, number of pegs left, score, and level number. Jump Over is yet another great game from Toon Classix! Full of cool colors, amazing graphics and fun game play - you can't go wrong! Think you have a good memory? Why not put it to the test with Mind Snap? You get to see a picture, memorize it the best you can - you'll be asked to match the section of the picture to where it should go. You'll only be able to pick the wrong section so many times before the game is over - clues are available if you're really stuck. The graphics are amazing and the sounds are fun. Both your memory and patience will be tested in this game. It's excellent! Qwik Point is a fun and fast game that will have you moving your mind and mouse. You'll have a grid in front of you with numbers, click them in order as fast as you can before time runs out. The further along the levels you get, the time gets shorter. You'll also receive bonus levels where you pick 4 numbers, then the computer will pick 4 numbers at random - if any match, bonus points for you! This program is amazing - I was extremely impressed and you will be too. 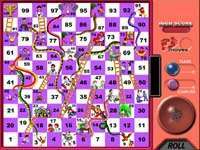 Snakes, Ladders & More is truly an incredible game. Roll the dice and move that number of steps on the board - but this is where it gets challenging. If you land on a ladder, you get to scoot up the board, closer to the end! Don't get too excited, though, there are snakes that are ready to slide you back towards the beginning. If you have a monitor with "Touch Screen" capability, you can play the game by touching the screen. Registered versions also have the ability to choose some of the rules of the game. Are you good enough to get on the high scoring list? This is a wonderful game - excellent graphics and fun play make this a MUST download and one of my personal picks. 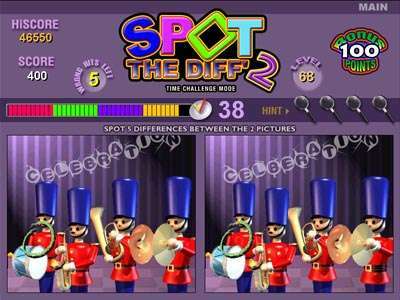 Spot the Diff' is a fun program that will have you putting your eyes to the test. You have 2 almost identical pictures in front of you - can you find the 5 differences? If you get stuck, there are clues available. While you play, listen to fun sounds and music. The pictures are great, the interface is brightly colored and fun. All in all, this is one great program! A highly recommended download! 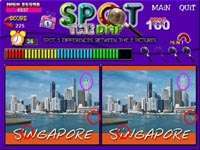 Spot the Diff' is a fun program that will put your eyes to the test. You have 2 almost identical pictures in front of you, your job is to find the 5 differences. If you get stuck, there are hints available to help you. Other features include fun sounds and music, great pictures and more. Star Litez is a fun memory game. There are colored areas outside of a star that will light up. You need to remember the order in which they light up, then push the colors in that order. Easy and fun! Remember Rubik's Cube? Color Shiftor is a similiar game. You have different colored blocks that you need to move the blocks around so they're in a line. Move them horizontally, diaonally or vertically. Get ready for a challenge!